Getting and Setting Managed Metadata Fields in SharePoint 2013 Workflows. In this post, I introduce the scenario, explain why you can't use built-in list actions to work with managed metadata fields, and provide a conceptual overview of the custom workflow activities approach. 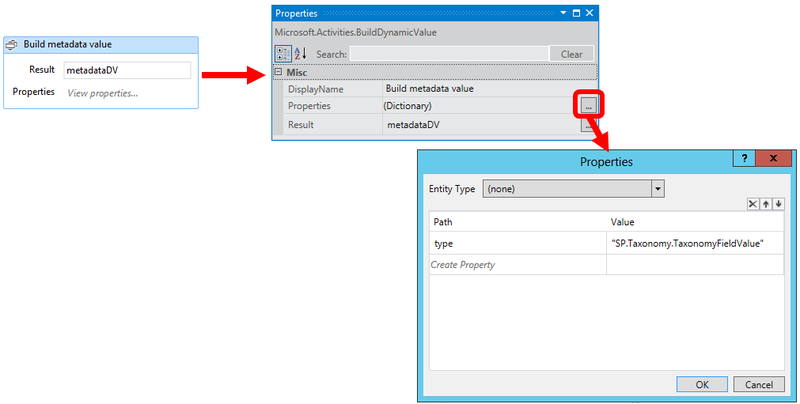 Custom Workflow Activity for Setting Managed Metadata Field Values (this post). In this post, I'll walk you through how to build a workflow activity that sets managed metadata field values on a list item. I've said it before, but it's worth repeating - you can use these custom workflow activities in any SharePoint Designer list workflows, including on Office 365 sites - custom workflow activities in SharePoint 2013 are entirely declarative, so deploying to SharePoint Online is not a problem. This series of posts tackles the scenario where you want to extract a managed metadata field value from an item in one list (previous post), and then apply that value to a managed metadata field in another list (this post). The main constraint is that the managed metadata fields in the source list and the destination list must both use the same term set. I want to be able to use this activity update a managed metadata field on any SharePoint list or library, so the first piece of information we need is an identifier for the target list or library (selectedList). Next, we need to know which list item to update. List items are commonly identified using either a GUID identifier (listItemGuid) or an integer identifier (listItemIdIn) - I've defined arguments for both so the workflow designer can use either approach to identify the target list item. Next, we need to know the name of the managed metadata field in the target list item (mmsFieldName). Finally, we need the two property values that uniquely identify our managed metadata term (termGuid and termLabelInteger). We'll use listItemId to store the integer identifier for the target list item. The emptyGuid variable is just an empty GUID that we'll use for comparison purposes, and the remaining variables (metadataDV, propertiesDV and fieldValueDV) are DynamicValue properties that we'll use to progressively build the correct JSON structure to update a managed metadata field. Build up the JSON payload we must provide in order to update the specified managed metadata field. Update the specified managed metadata field on the specified list item. Let's take a closer look at these three high-level tasks. Our first task is to get an integer identifier for the target list item. Remember that we're giving the workflow designer two options: he or she can provide either a GUID identifier or an integer identifier to specify the target list item. To cater for both scenarios, we use an If activity. If the list item GUID is equal to an empty GUID, we can assume the workflow designer has used an integer identifier to specify the target list item. In this case, we use an Assign activity to set the the listItemId variable to the value of the listItemIdIn argument. If not, we use a LookupSPListItemId activity to look up the integer identifier using the specified GUID and then set the listItemId variable accordingly. Notice how we set the __metadata key to the metadataDV value we created in the previous step, thereby creating a nested DynamicValue instance. 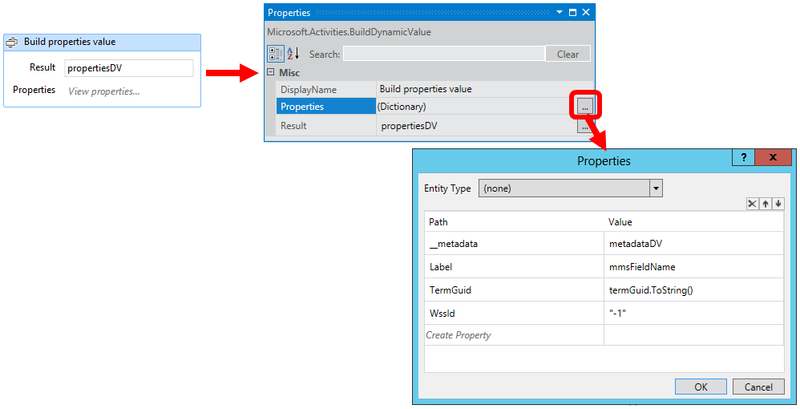 Note: We use a CreateDynamicValue activity rather than a BuildDynamicValue activity in this task because it allows us to set the dictionary key (PropertyName) to a variable value (mmsFieldName in this case). The BuildDynamicValue activity only allows you to type static string text for the dictionary key (Path). That wouldn't work in this scenario as we don't know the name of the target managed metadata field at compile time. In this case, I'm using my Get MMS Field Value activity to get the term GUID and the term label integer from a managed metadata field named Customer in the current list item. I'm then using the Set MMS Field Value activity to set the value of the Client field on a list item in the Clients list to the same term. Because the source Customer field and the destination Client field both use the same term set, the workflow is able to copy the value across as desired. Great blog this has been extremely helpful. I have been recreating this on my end for something very similar but I get a problem with using 'GUID' in the LookupSPListItmId Property name. It produces an error in visual studio "The name 'GUID' does not exist in the current context." Was just wondering if you had seen this before or know why my Visual Studio is giving me this where yours did not. Again Great article it has been extremely helpful. Hi Groller - I think I know what the problem is... when you use the editor to set the PropertyName value, you need to put GUID in quotes - i.e. "GUID". That way it treats it as a string value. Otherwise it's looking for a local variable named GUID. The Properties window will still show GUID without the quotes, which is probably where the confusion arose. I'll definitely have a look at your solution ;-) One question that comes to my mind, what about Multi value managed metadata ? How difficult is it to handle these also ? Hi Marc - setting multi-value MMS fields isn't something I've tried yet, but it shouldn't be a problem if you follow a similar process. Start by using the REST API to have a look at the structure of list items with multi-value MMS fields in the browser window. Once you know how the multi-value fields are structured in JSON, you can create a workflow activity that builds up a field value in the right format. Hi Jason, using SharePoint Designer only I was not able to do it. The problem is that you cannot add a collection of dictionaries in SPD, and that is what you need for a multi value. That is exactly why I will have a more in depth look at your custom activity to see if it is possible to extend it. Can't promise it will work, but that would be my starting point. I'll give it a try and write a post on it when I have some time. where [Label1] is your first term label and so on. Hi Jason, so far I was not able setting the "item" property. After looking at https://msdn.microsoft.com/en-us/library/office/dn312554.aspx I guess it is readonly. Have you had time figuring out how a managed metadata field (multiple values) can be set? Hi Christian - sadly I'm slammed at the moment, so I've had no chance to sit down and try to figure out the multi-value MMS scenario. It's on my to-do list for the next time I get a quiet day! Any luck on getting this to work? I've tried many variations, but can't seem to get the right combination yet. Hello, there is no files .actions4 in my solution explorer, is this normal? I'm working with sharepoint online. Sorry about the delay, missed this one - Visual Studio should create an actions4 file along with a XAML file every time you create a new workflow activity. If you created a workflow, rather than a workflow activity, you won't have an actions4 file. 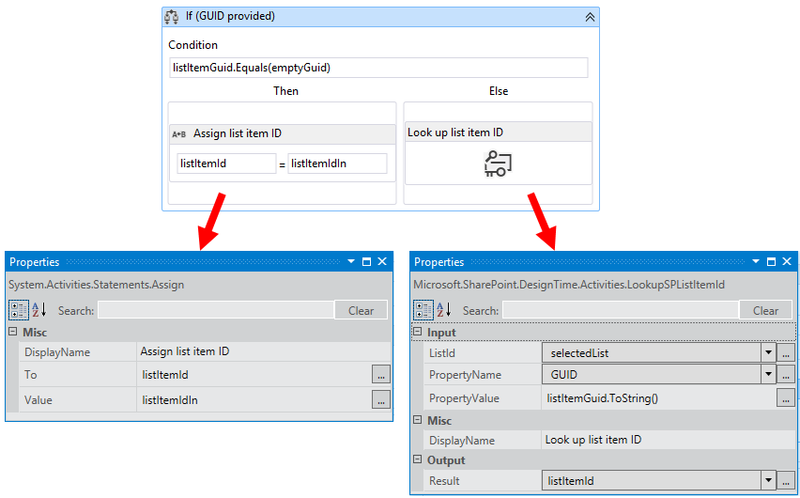 The actions4 file is just to help the SharePoint Designer UI interact with your workflow activity, so if you're creating an entire workflow in Visual Studio you won't need one.